The Arduino makes learning about microcontrollers very approachable. However, messing around with breadboards to make circuits may be daunting for the beginner. Olympia Circuits makes it even easier to get started with the Arno board. 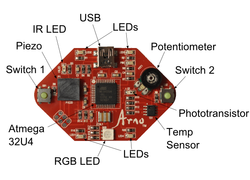 Arno is an Arduino compatible board that includes the components needed to complete several experiments. Since the components are built in, there’s no need to reach for a jumper wire or find that LED that rolled under the bench. The Arno kit also comes with an instructional book. There is also an Arduino shield in the offing for those who still want an Arduino. This certainly makes it easier to concentrate on the programming side of things without having to worry about having the right parts or hooking up the circuit the wrong way. Although, I like creating the circuits on breadboards. It gives me ample opportunity to learn from my mistakes. If you’re like me, and you’re looking to get started with Arduino, I recommend the Arduino Experimentation Kit (ARDX), it comes with everything you need to complete several experiments.